Beer overflows at the 22nd Annual Oktoberfest in South Lake Tahoe. 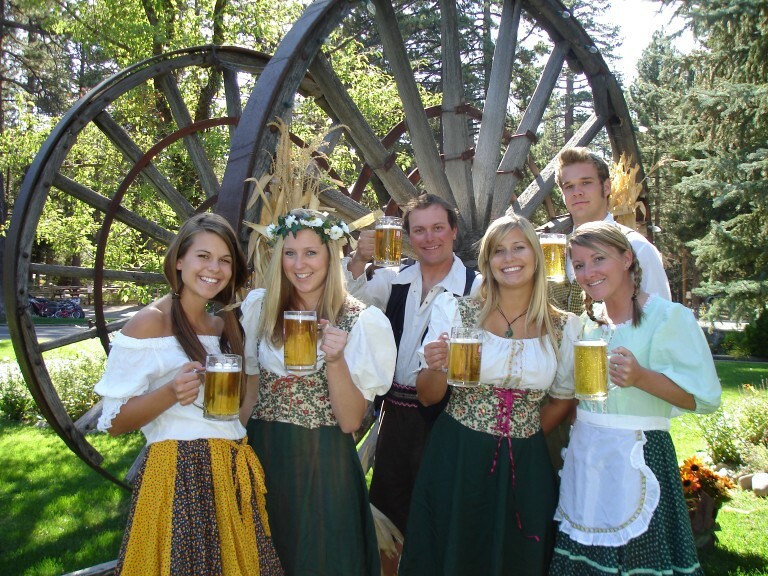 Don’t miss the 22nd Annual Oktoberfest when you visit Lake Tahoe October 1st and 2nd, 2016. 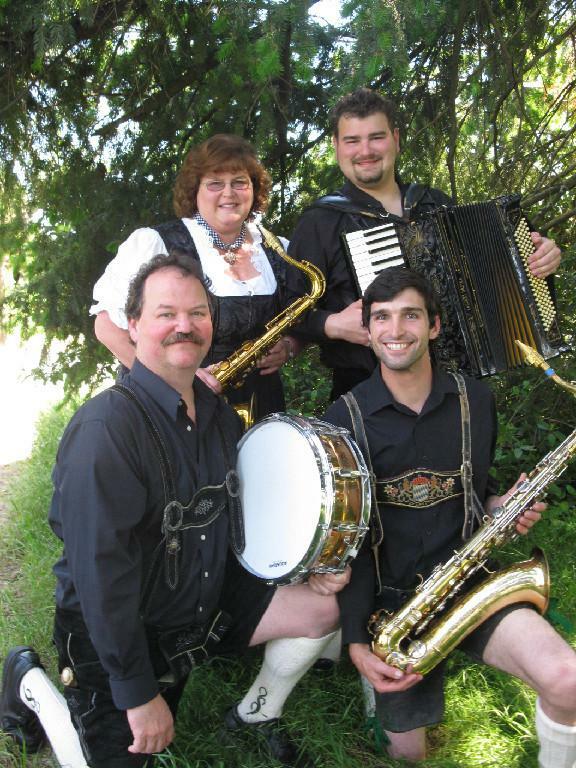 Oktoberfest celebrations at Camp Richardson provide entertainment for the whole family. 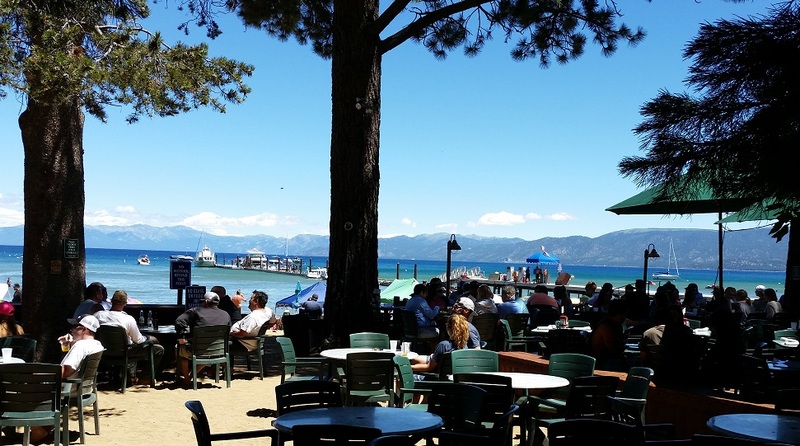 Join locals at Oktoberfest in Lake Tahoe to enjoy fabulous food, live music, and the famous Beer and Wine Garden. Oktoberfest celebrations for the entire family. 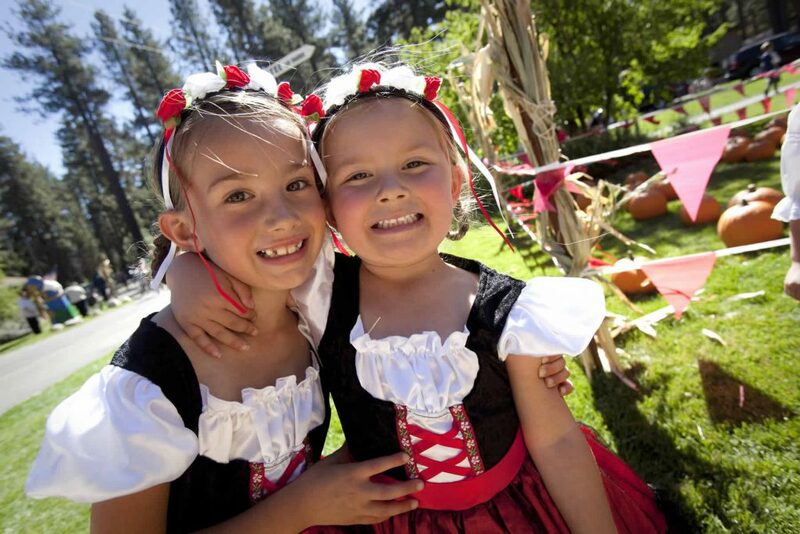 Join in the celebrations at Oktoberfest in Lake Tahoe located at Camp Richardson Resort. Website: www.camprichardson.com. 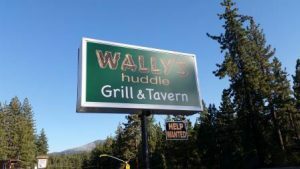 When you visit Lake Tahoe, a good way to get a feel for the nostalgia of 1950’s Tahoe and rub shoulders with the locals, would be to stop in at Wally’s Huddle Grill and Tavern. Formerly known as “Sam’s” for many years, Wally’s Huddle is located on Highway 50 in Marla Bay, between Roundhill and the Zephyr Cove Resort. 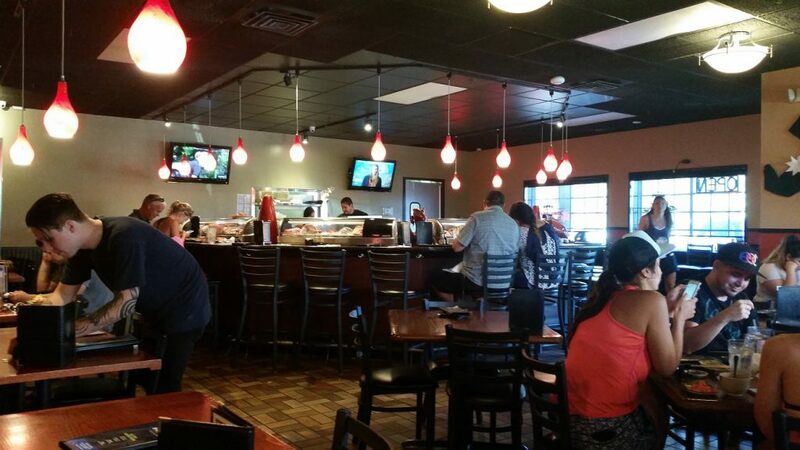 Recently remodeled and open for business, Wally’s offers pub fare such as fish and chips, burgers and pizzas. The selection of draft beers on tap is limited but they offer a Tahoe Pale Ale that is quite tasty. Sit by the fireplace or, in nicer weather, enjoy the waterfall and beer garden out back. Our visit included chips and salsa, fish and chips, a French dip sandwich with fries, two iced teas and a Tahoe Pale Ale and the bill came to $35.56. The prices are good and the food was very good. The customer service was also pleasant. There is ample seating at the bar to watch a game and socialize or there are plenty of tables to enjoy a bite with friends. 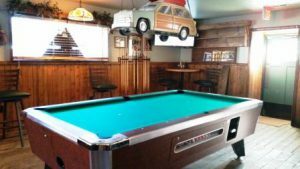 Play a game of pool and unwind in a relaxed and informal atmosphere at this restaurant in South Lake Tahoe. 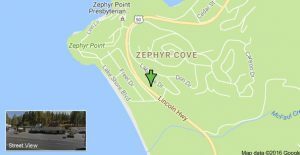 Wally’s is located at 611 Hwy 50, Zephyr Cove, NV 89448. Life is sweeter when you visit Lake Tahoe. 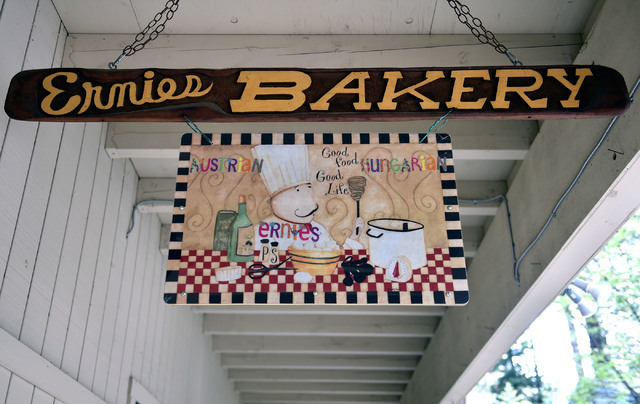 Ernie Feld is the head pastry chef and owner of Ernie’s International Pastries in Incline Village, Lake Tahoe. 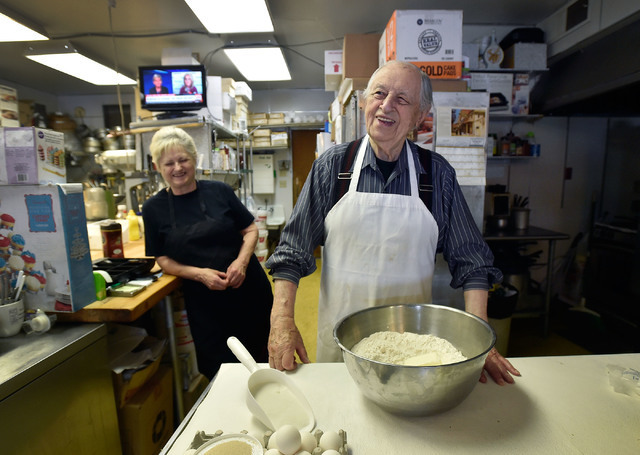 He has been operating his successful bakery in Incline Village since 1976. Come try a Poppy Seed Strudel, one of his specialties. Ernie learned to cook in Lucenec, Czechoslovakia, where he was born in 1925. Yes, Ernie is 91 years old. Ernie’s mother ran a restaurant in town. In 1942 the Nazis rounded up all the Jews in Czechoslovakia, including young Ernie. As a teenager Ernie baked exclusively for the Third Reich who held him captive during World War 2. Ernie had a skill the German’s valued and requested that the Germans send him additional captives to work in his kitchen, saving many souls from certain death. During Ernie’s time in captivity many other members of his family were sent to Auschwitz and never seen again. Ernie has been feeding the residents and visitors of Incline Village, Lake Tahoe since 1976. He speaks seven languages and is often asked to take a picture with young tourists. Ernie is ready for a little relaxation and has put his business up for sale. To read the full story of Ernie Feld visit the Las Vegas Review Journal. To try one of his treats, visit Ernie’s International Pastries, 120 Country Club Drive, Incline Village. 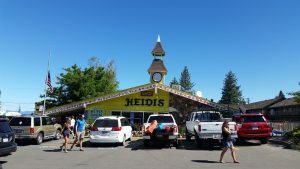 You cannot go wrong stopping in for breakfast at Heidi’s when you visit Lake Tahoe. Heidi’s restaurant features hearty breakfasts in a Scandinavian inspired atmosphere. The distinct yellow chalet can be found in the center of South Lake Tahoe in the Bijou shopping center right next to the CVS pharmacy. You can’t miss the bright yellow chalet right next to Highway 50/South Lake Tahoe Blvd. 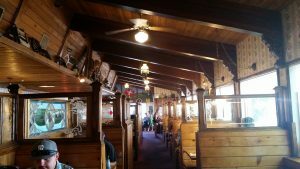 The interior is covered with hardwood, knotty pine and features numerous wooden booths for seating. You would expect to see a Black Forrest cuckoo clock on the wall, reminiscent of Bavaria. There is a mural of the Matterhorn to complete the setting. I had the opportunity to take a beautiful woman out to breakfast the other day and we stopped into Heidi’s which was very busy but it was only moments for a table. The service was excellent and the food high quality and plentiful. You will not be leaving here hungry. 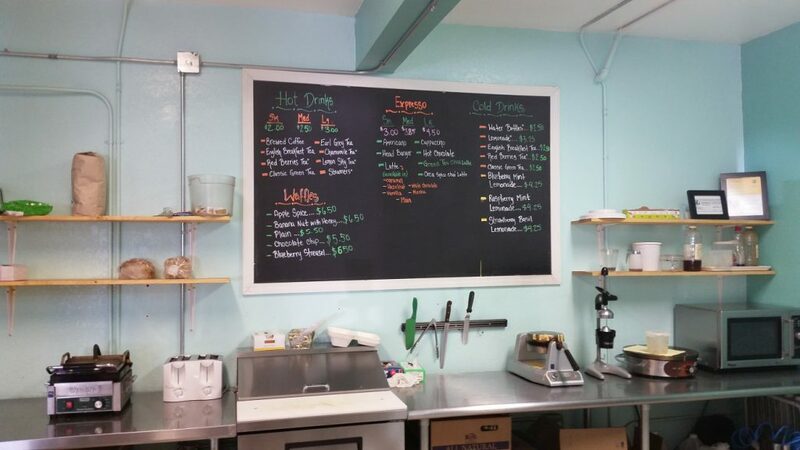 In addition to breakfast, Heidi’s has a wide variety of food options including lunch items. My wife chose the chicken fried steak and eggs and I opted for the Joe’s Special omelet. With a coffee and an iced tea, the bill came to $37.55. 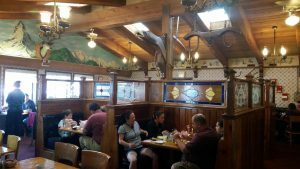 Although the restaurant had a lot of hustle and bustle, moving diners in and out, we were not made to feel rushed and the servers were attentive. 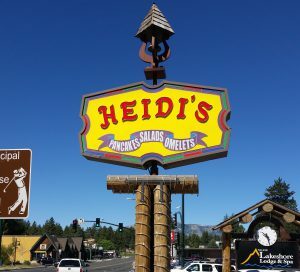 We both enjoyed our meals and would recommend stopping at Heidi’s Restaurant in South Lake Tahoe. Come enjoy our hospitality! 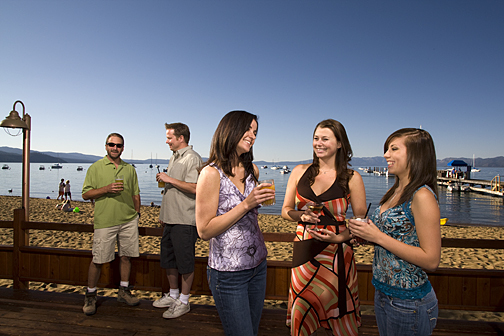 Feel like a local when you visit Lake Tahoe. 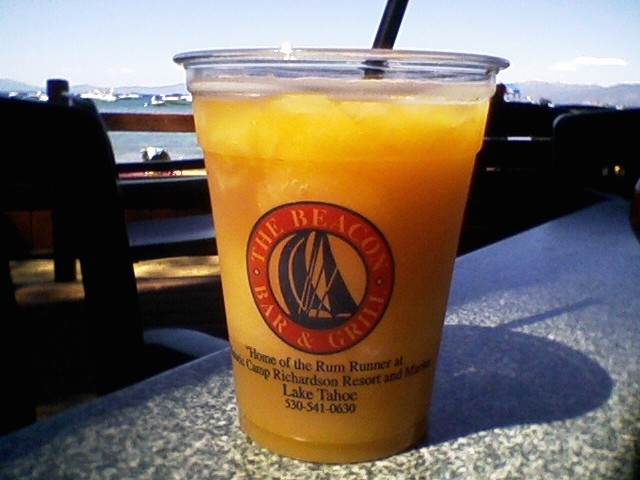 The Beacon Bar & Grill is my favorite restaurant in South Lake Tahoe. 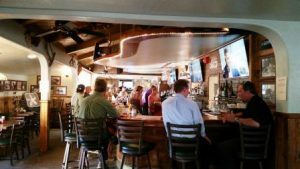 The Beacon marries great food, friendly service and the perfect atmosphere, creating the best restaurant in South Lake Tahoe. Enjoy live music and outdoor seating on the beach with unobstructed views of the entire lake. Generous umbrellas provide shade on super sunny days, while fire pits and elegant heaters keep you comfy when it gets chilly. 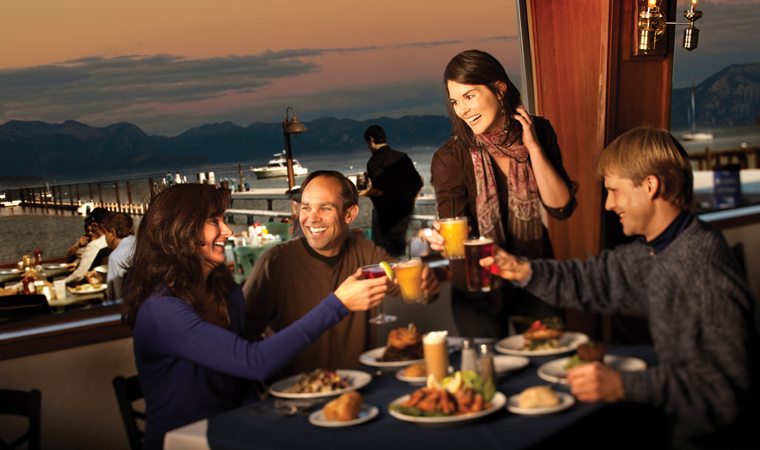 Sunset at Lake Tahoe is an unforgettable event and the Beacon Bar & Grill offers premium seating for each evening show. The Beacon offers typical pub food with gourmet flavor. You will find appetizers like Deep Fried Calamari or Chipotle Shrimp & Sausage Nachos for under $20. Lunch entrees include the best fish & chips in South Lake Tahoe for $14. Dinner surf and turf offerings for dinner range from Clam Chowder in a bread bowl for only $10 to Filet Mignon for $39. Kids will enjoy tasty treats like Slider Burgers or Mac & Cheese from the children’s menu. The Beacon Bar & Grill has a full service bar with HDTVs tuned to your favorite sporting event. Try their house special Rum Runner, absolutely the best Rum Runner on the planet! 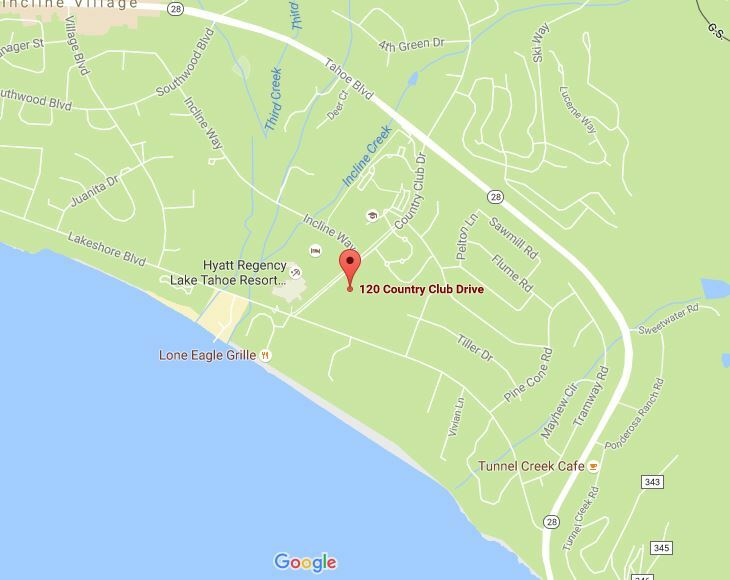 The Beacon Bar & Grill is located in Historic Camp Richardson Resort at 1900 Jameson Beach Road. From South Lake Tahoe take Highway 89 toward Emerald Bay. 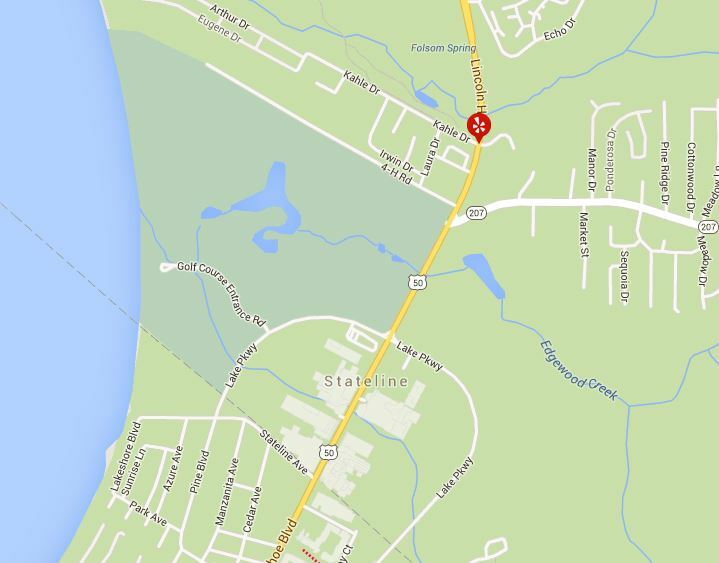 You will find the turn off for the Beacon Bar & Grill approximately 2.6 miles from the ‘Y’ in South Lake Tahoe. The Beacon Bar & Grill is open 7 days a week from 10:30 am to close. 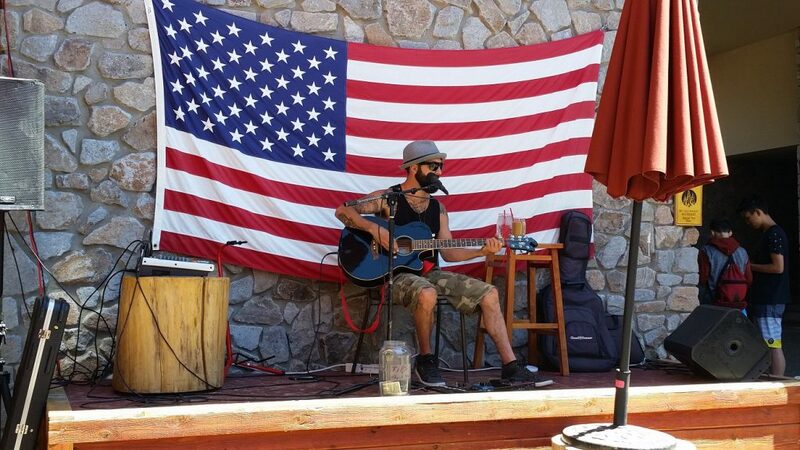 Live music is feature from 1-5pm every day (except Tuesday) during the summer. The cheesiest, crustiest, sauciest pizza in Tahoe is located at Base Camp Pizza Company in the heart of Heavenly Village. When you visit Lake Tahoe you must try Base Camp Pizza Company. 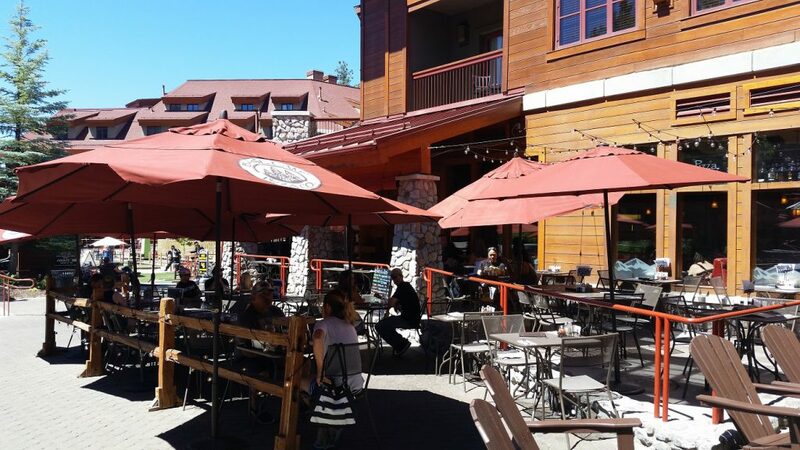 If you want to try the best pizza in Lake Tahoe – eat at Base Camp. If you love live music – eat at Base Camp. If you love hand-crafted drinks – eat at Base Camp. 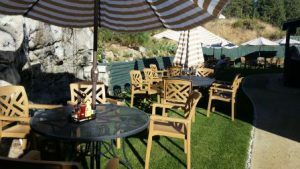 If you enjoy hanging out with friends in beautiful Lake Tahoe, eating out of doors with live music, eating indoor while watching the game, or just having the perfectly prepared pizza, Base Camp Pizza has got you covered. Base Camp Pizza has a large salad menu, appetizers and kids menu. Vegan? No problem. Gluten free? No worries. Base Camp has you covered. Perhaps you just need a place to relax and enjoy a beverage. Base Camp has a bar area with HDTVs where you can catch the game with your hand crafted drink. Need a bite to eat in the bar? No problem. Base Camp has you covered. 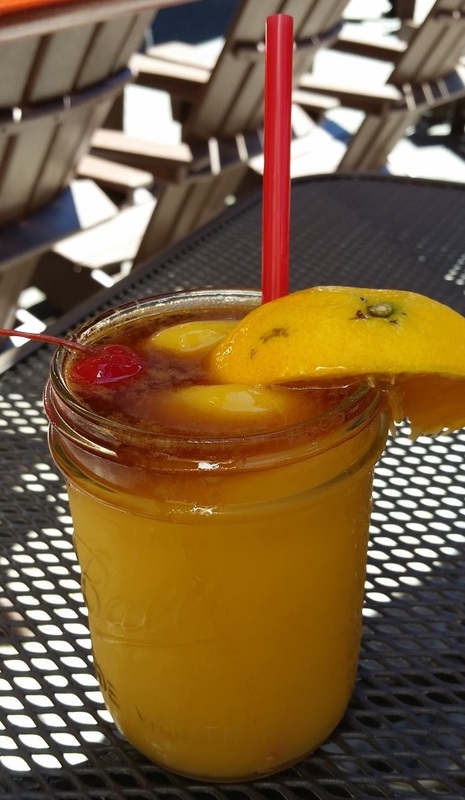 Base Camp has the best pizza in Lake Tahoe but don’t overlook their signature drinks. Try the Happiest Camper, my favorite. If you like root beer, they have a signature root beer drink for adults that you must try. 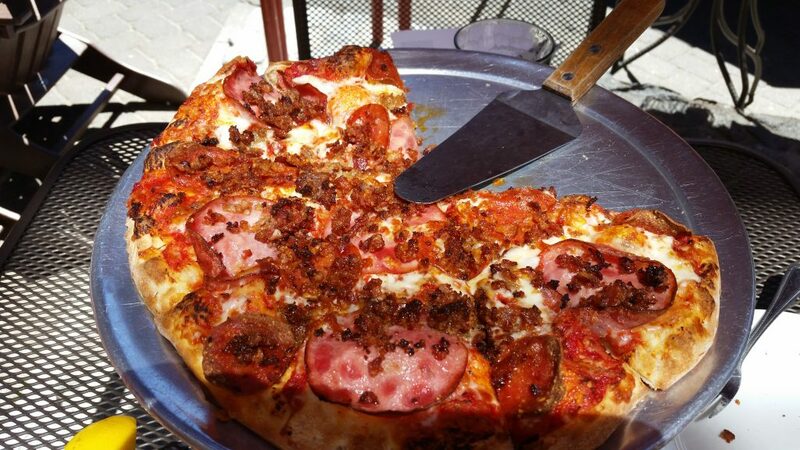 Base Camp Pizza Company is a “must eat” when you visit Lake Tahoe. 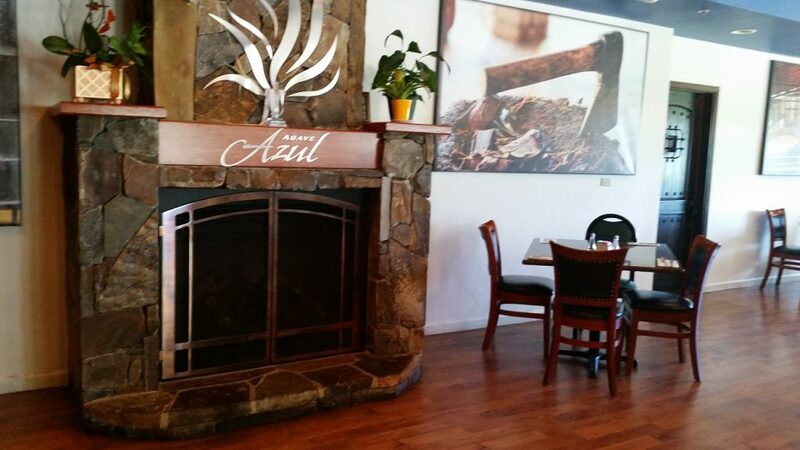 Azul Mexican Grill offers authentic, gourmet Mexican food for your dining pleasure when you visit Lake Tahoe. In July of 2015, Jose and his daughter came to Lake Tahoe on vacation. 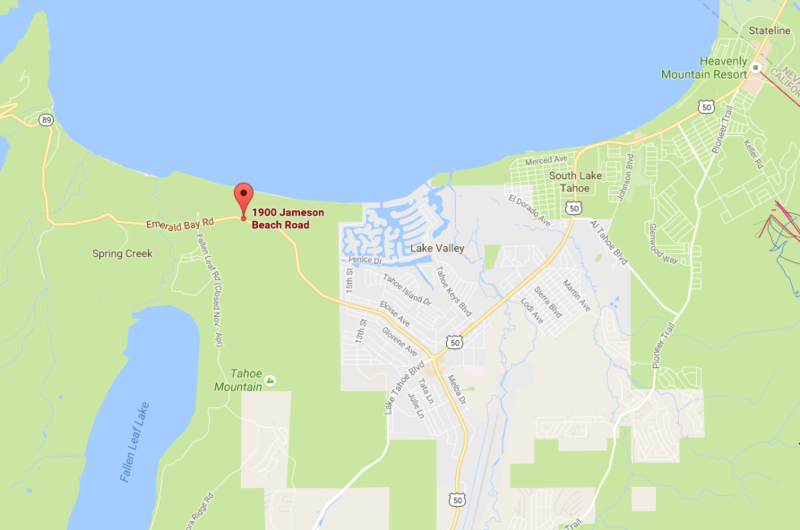 They were so enraptured with the beauty of Lake Tahoe that Jose decided that this would be the location of his next restaurant. Jose is a veteran restaurateur and talented chef. Agave Azul Mexican Grill was born. It has been a favorite of my family since the first day we walked in the door. The food is unmatched and the service impeccable. 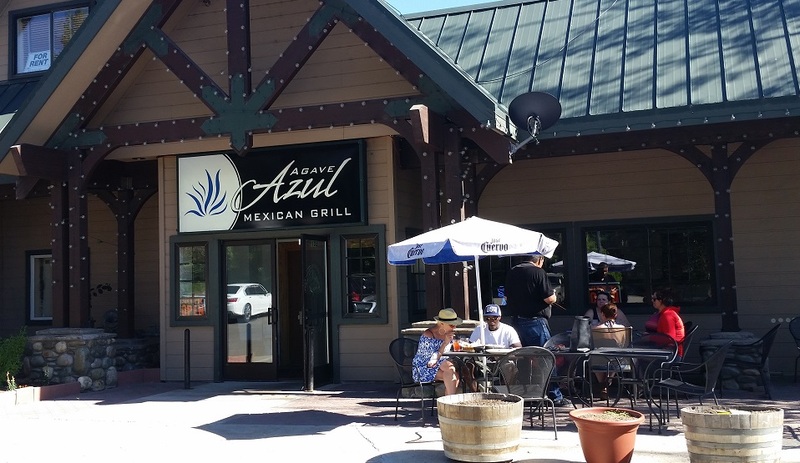 The Azul Mexican Grill serves the best Mexican food in Lake Tahoe with the perfect blend of elegant and comfortable ambiance. The traditional dining room has both tables and generous booths. It is the ideal location to bring your family and friends for a relaxing, delicious meal. Perhaps you want to catch the game with your meal. The Azul also offers a bar & grill dining area where you will find comfortable tables and HDTVs for your viewing pleasure. Let’s face it, we really just want excellent food. The Azul Mexican Grill will not disappoint. Your meal begins with chips, salsa and this really great bean and cheese dip. The appetizers are heavenly. 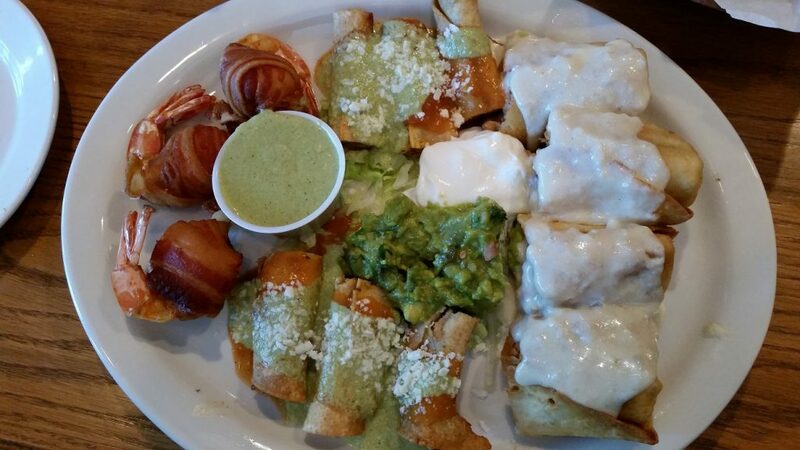 You must try the Agave Azul sampler (shown below). Yes, those are bacon wrapped shrimp stuffed with mozzarella cheese. This appetizer is generous enough to provide the entire meal for two people. My favorite meal is the Agave Azul Enchiladas. My husband favors the Agave Azul fajitas with home made corn tortillas that melt in your mouth. Whatever you order, make sure to ask for the home made corn tortillas. I did not even like corn tortillas until Jose convinced me to try his. Now I can’t get enough of them. I also highly recommend their ceviche. The Azul Mexican Grill provides a full bar service. Their signature drinks are divine. My favorite is their Watermelon -Rita. 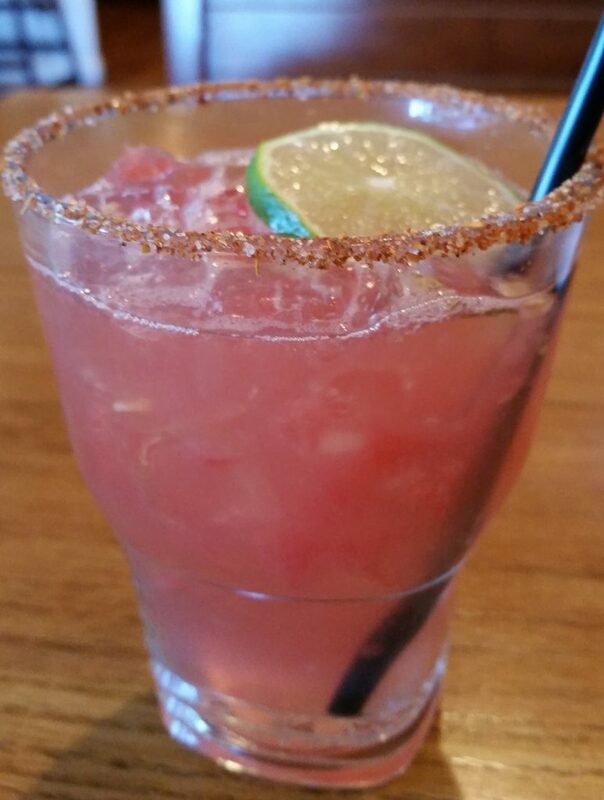 (shown below) It has actual chunks of watermelon floating in the drink. The best beverage after a day in the sun, to accompany the best Mexican food in Lake Tahoe. Dinner at the Azul Mexican Grill will run you an average of $15 a plate plus drink and gratuity. Breakfast and lunch will cost less. Happy hour runs from 3 to 6 pm. The Azul Mexican Grill is open Monday through Friday fro 10:30 to 9pm, Saturday and Sunday from 10 am to 9 pm. 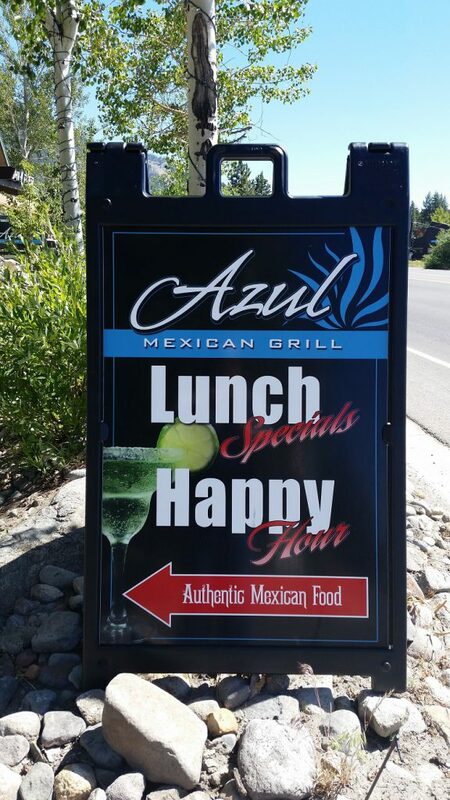 You will find the Azul Mexican Grill on the Nevada side of South Lake Tahoe, less than one mile from the state line. Be careful not to mistake it for Azul Latin Kitchen in Heavenly Village. 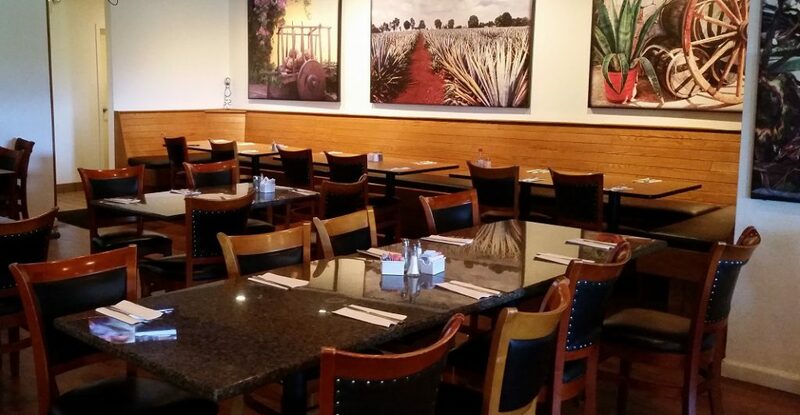 The Latin Kitchen is more of a Cal-Mex blend, rather than authentic, gourmet Mexican like the Azul Mexican Grill. Take Highway 50 out of California, into Nevada, 0.6 miles. It is just past the Lakeside Inn, next door to Sushi Pier, on the right hand side of the road. 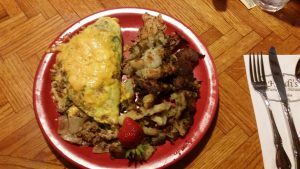 Red Hut Cafe – Ski Run location serves dinner also. 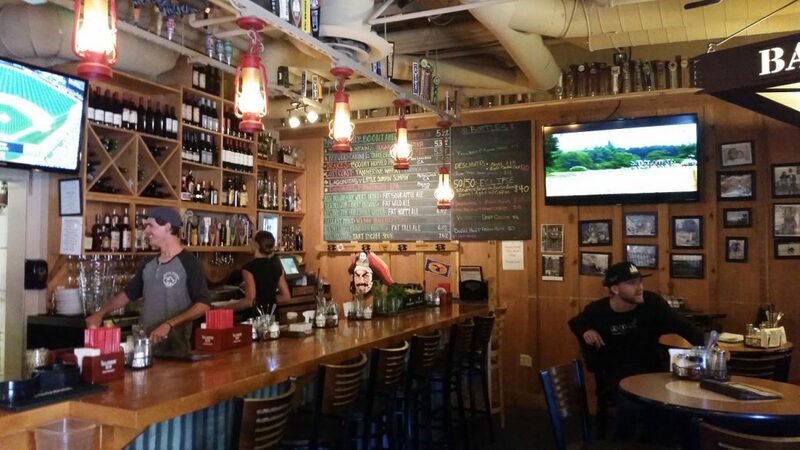 The Red Hut Cafe is a Tahoe fixture and a ‘must go’ when you visit Lake Tahoe. The Red Hut is historically a breakfast café but you can also enjoy a great lunch. 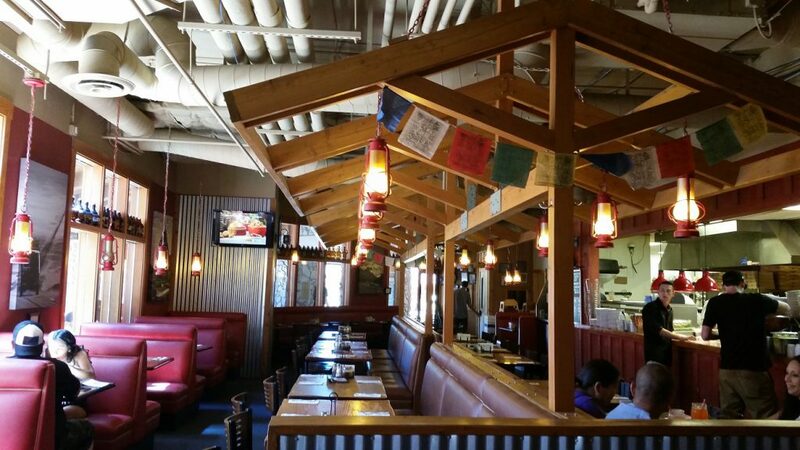 You will find three Red Hut locations in South Lake Tahoe. The original cafe is located in the middle of South Lake Tahoe on Highway 50 (Lake Tahoe Boulevard). In 1959 Mac & Lorraine moved the old donut shop from the state line, 2.5 miles down Highway 50 to its current location. Lorraine and her daughters worked the dining room and Mac prepared the best breakfast in Tahoe. Lorraine and Mac sold the business in 1984 to the current owners, and long-time customers. The Gardner family still runs the business today, which looks and tastes very much as it did in 1959. The Gardner family has opened several additional locations since then. 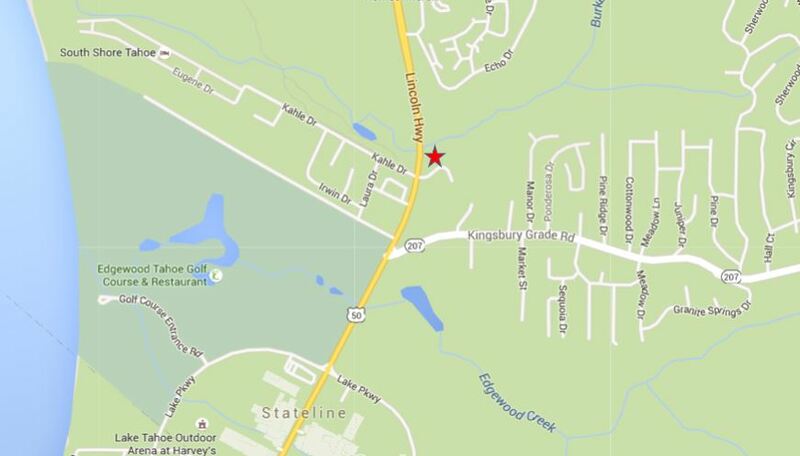 In 1990 the Kingsbury Grade location opened. This is my favorite Red Hut spot. It is a little roomier than the original location with peek-a-boo view of Lake Tahoe. The Ski Run Red Hut opened in 2009 and is the first Red Hut Cafe to offer dinner. (The Ski Run location also contains an old fashioned soda fountain.) 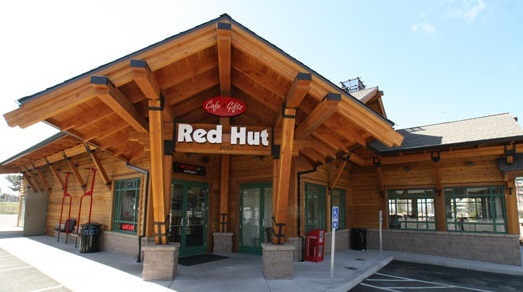 Since then, Red Hut Cafés have opened in both Carson City and Reno, NV. 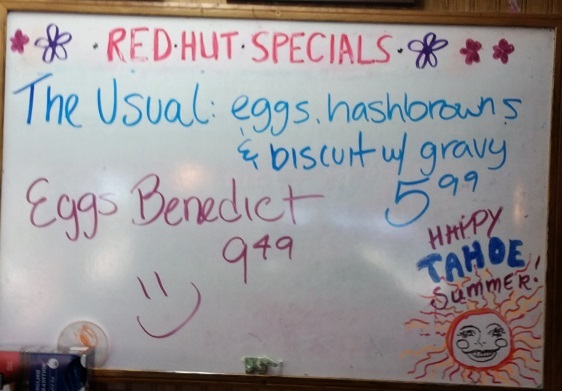 Breakfast is the specialty of every Red Hut Café. Traditional breakfasts with waffles, pancakes, bacon & eggs, and omelets are served with excellence every day. These are breakfasts of huge proportions and ‘The Usual’ is a local favorite. If you are tanking up to hit the slopes for the day, the Red Hut has you covered. Daily specials often include fresh fruit and breakfast is served all day. Expect to pay about $10 for your meal and a couple bucks for your drink. My husband and I never pay more than $30 for the two of us: two meals, two coffees, one juice and a 20% tip all for just under $30! Life does not get much better than that. The Original Red Hut is located at 2723 Lake Tahoe Blvd, South Lake Tahoe, CA. Red Hut Cafe Nevada is located at 229 Kingsbury Grade, Stateline, NV. 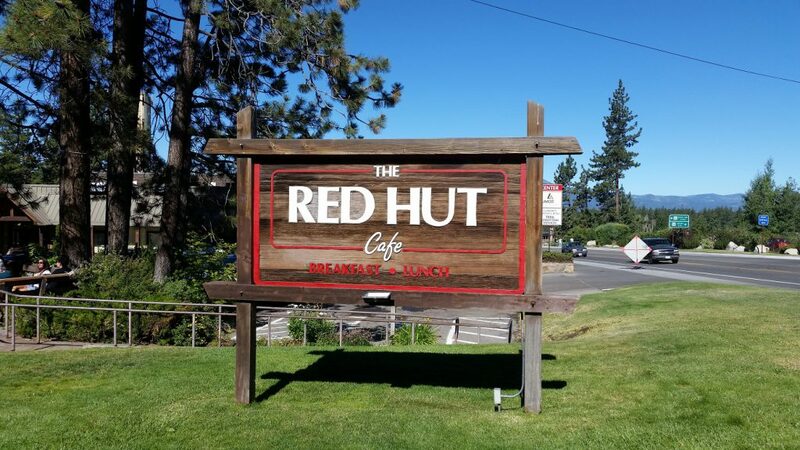 Red Hut Cafe Ski Run is located at 3660 Lake Tahoe Blvd, Corner Hwy 50 & Ski Run Blvd, South Lake Tahoe, CA. 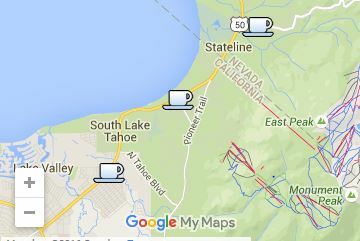 Locations of 3 Red Hut Cafes in the Tahoe Basin. Fresh, delicious, all-you-can-eat sushi with excellent service when you visit Lake Tahoe. Sushi Pier chefs are the artisans of great, nutritious food, providing a superior dining experience. Yes, it is all-you-can-eat for $27. This includes appetizers, long rolls, hand rolls, mussels, shrimp and dessert, every kind of sushi on the menu. The servers are extremely attentive and you can put in multiple orders of the same item at once. The truth is that I grew up in the Bay Area and never liked Sushi. My husband and kids love sushi but I would always order a Bento Box with teriyaki chicken. Occasionally I would have a piece of California roll since I do not like the texture of raw fish. Then we moved to Tahoe and my twenty-something daughters were so excited about Sushi Pier they convinced me to not only go, but to try some sushi. I LOVE it. Sushi Pier has a variety of sushi offerings that include cooked fish, for those in your party that may be sushi wimps (like myself). The Mid-town roll is my favorite. 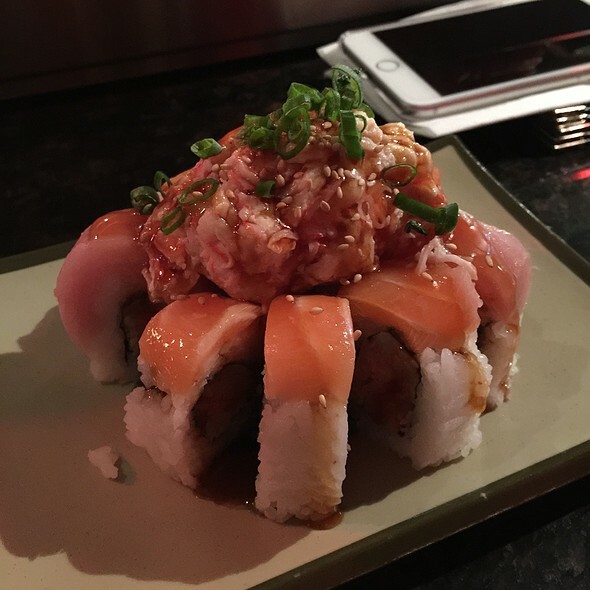 The Mount Rose roll is super yummy and a local favorite, topped with crab and scallops. The baked mussels are a ‘must have.’ The Nigiri is excellent; the Mickey, the Donald and the fresh water eel are my husband’s favorite. My son and his wife love the quail egg shooters. And don’t forget dessert. The ‘Happy Ending’ is as good as it sounds. Sushi Pier serves traditional Japanese drinks, specialty Sake cocktails, beer and a full compliment of well drinks. Six HDTV’s are broadcasting sporting events for your viewing pleasure. Sushi Pier is open for business Monday -Saturday 11:30 to 9:30 and Sunday 11:30 to 9 pm. 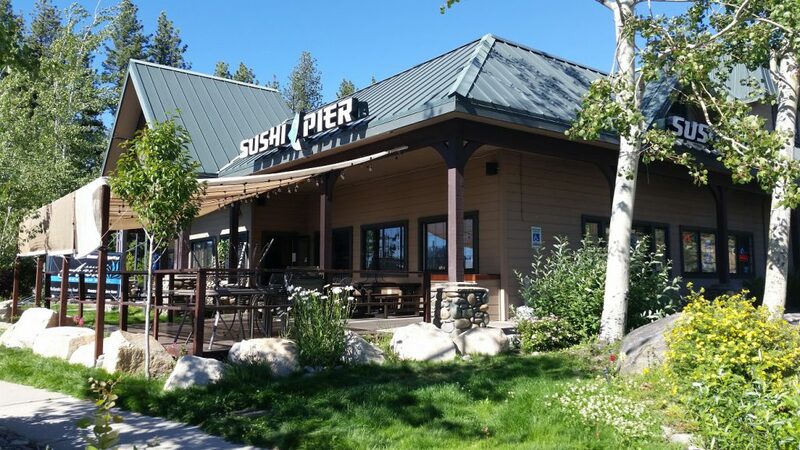 Sushi Pier is located at 177 Lake Tahoe Boulevard (Highway 50) in Stateline, Nevada. From South Lake Tahoe, California, take Highway 50 out of California into Nevada 0.10 miles. Sushi Pier is on the right hand side of the road, just past the Lakeside Inn. South Lake Tahoe Bakery makes the best Cinnamon Rolls on Earth! The cinnamon rolls at Sugar Pine Bakery are nothing short of heavenly. Warm it up for just 5 seconds in the microwave at it will literally melt in your mouth. You better come early. Sugar Pine Bakery makes everything fresh and their cinnamon rolls sell out before 10 am almost every day. Let’s face it, everyone comes to Lake Tahoe to treat themselves and celebrate their lives. Weddings, birthdays, anniversaries, graduations, and promotions of every kind are blissfully celebrated with edible treats. On vacation we usually purchase our baked treats after we arrive at our destination. Heck, getting to vacation in Lake Tahoe is a celebration in itself. 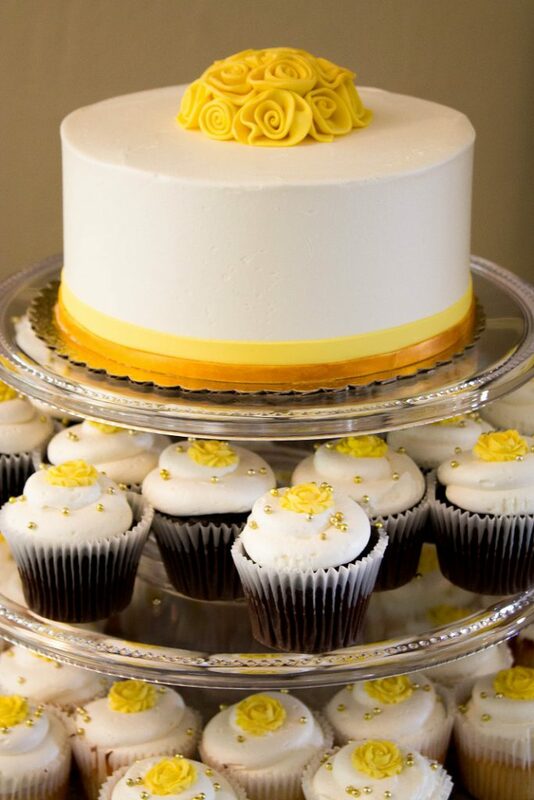 Sugar Pine Bakery is ready to make your celebration just a little sweeter. 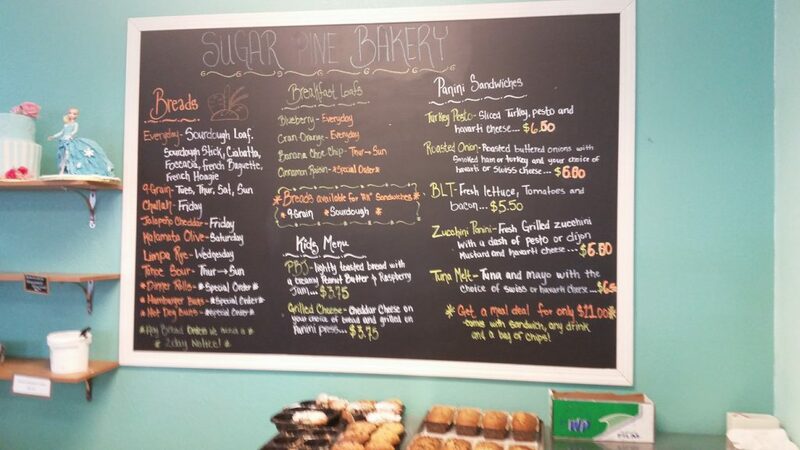 Sugar Pine Bakery sells much more than cinnamon rolls and cakes. 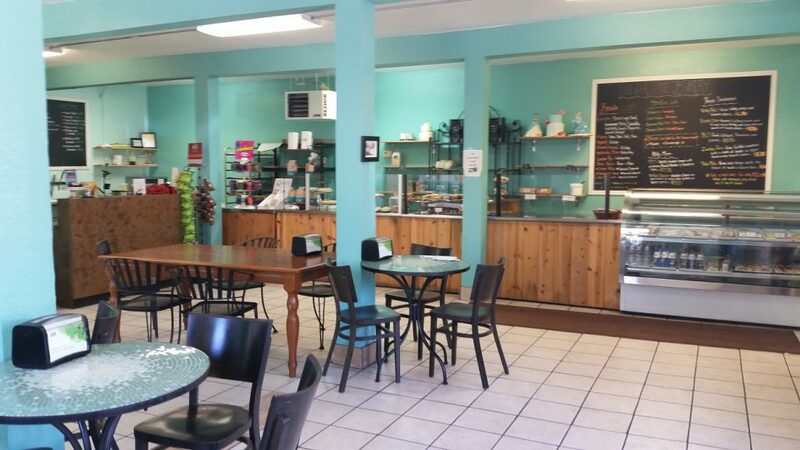 Come by the bakery and enjoy a cup of coffee or specialty drink. Order a sandwich or some homemade granola. You find the most creative pastries of every type as well as childhood favorites like chocolate chip cookies. Don’t forget to get a loaf of fresh baked bread before you go. Ask for a loaf of Tahoe Sourdough. Sugar Pine Bakery carries many fresh bread choices but my favorite is Tahoe Sourdough. No, it is not just sourdough bread made in Tahoe. Tahoe Sourdough bread has a real rustic consistency that melts in your mouth once you bite into it. It is great paired with soup or chili. I especially love that the server will ask you if you would like your bread sliced before they pack it up. They use a vintage bread slicer and package it while you wait. This keeps the bread from getting stale or dried out by sitting sliced all day. Every special occasion in my home includes baked treats from Sugar Pine Bakery. If you have a specialty order – no problem. 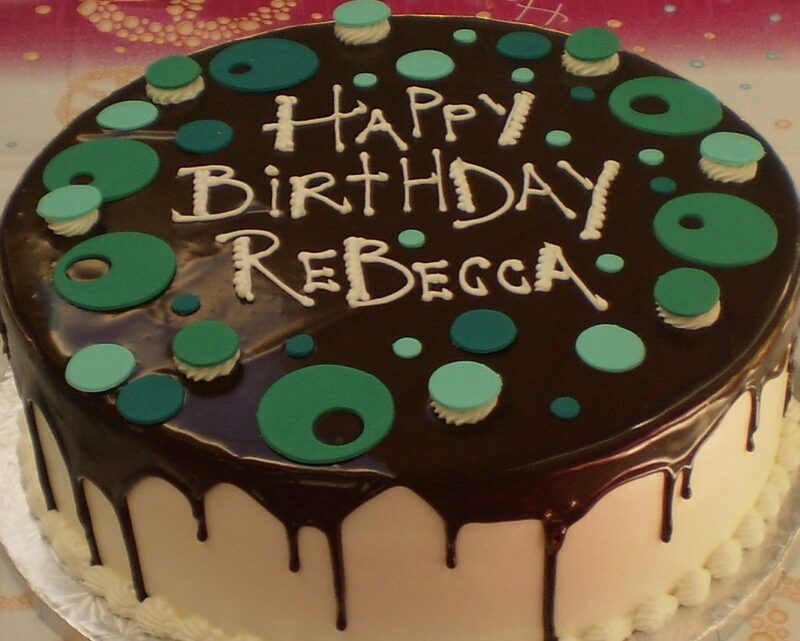 The artisans need at least a week’s notice for specialty cakes. I hosted a party for my parents 50th Wedding Anniversary and of course Sugar Pine Bakery provided the cake. This cake was not only a dessert, it was the loveliest decoration in the room. 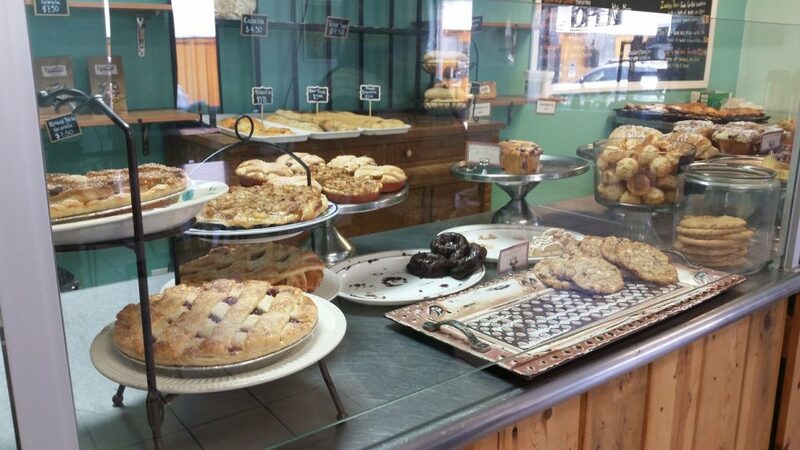 The service at Sugar Pine Bakery is without fault. Owners Jonathan & Teresa Argon are usually either waiting on customers or cooking in the back. Either way, they are at your service if you just ask. Visitors commonly ask me to recommend a South Lake Tahoe bakery. My ‘go to’ bakery is Sugar Pine Bakery in South Lake Tahoe. 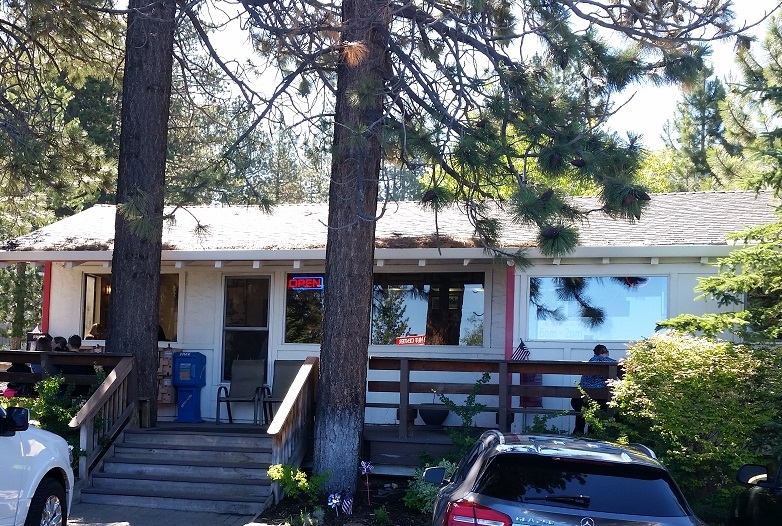 Sugar Pine Bakery is located at 3564 Lake Tahoe Boulevard, next to Herbert Street just west of Ski Run Boulevard. The store front is not easy to see at first because is sits back from the road, just behind the Tahoe Hemp Company. For more information please check out their website: mysugarpinebakery.com. 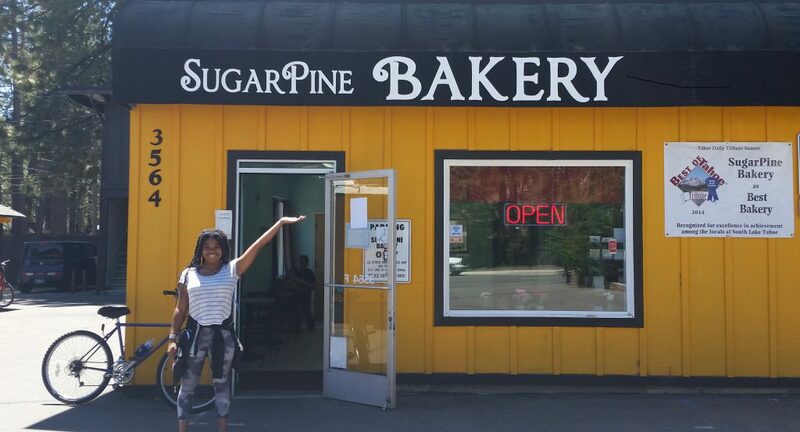 When its time to find a South Lake Tahoe bakery remember Sugar Pine Bakery and you will not be disappointed.